…about a little thing called laziness. 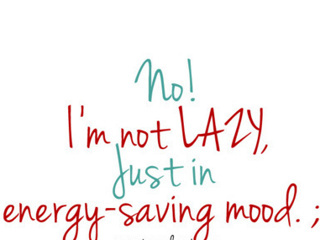 Yes, laziness. You know, that thing that forces you to watch Netflix instant, even when you have other, more important things to do? That overwhelming feeling that seems to take over whatever good intentions you had for the day? Yeah, that. I’m going to make a radical statement: Laziness can be a good thing. Okay, so I realize that I spend a lot of time writing about drive, stick-to-it-iveness, and maintaining focus. I believe in all of those things, and I wholeheartedly believe that we are each on this earth to fulfill our greatest dreams and desires. But I also realize that we’re all human, and as humans, we need a little veg time. Take today, for example. After working about six hours (with a solid four left to do), I relaxed. You see, my threshold for work is only so high. I can and do maintain high levels of productivity over prolonged periods of time under extreme stress, but today I’d had about enough. I needed to sit and watch two movies, back-to-back, play with our kitten, and have a glass of wine. Tomorrow, I will approach my work with a fresh brain, and I will be productive. For now, I’m going to pour myself another glass of wine and allow myself to relax. Oooh! And one of the babies mumbles, “Muh, muh, muh!” now! Progress in the midst of laziness! Oh, goodness…I read about your poor hand! So sorry to hear about that. I wish I was closer so that I could help. :-/ But, then again, you deserve some forced laziness!